You remember the Jefferson Lift? Well meet Mr. Jefferson. Charles G. Jefferson once partially deadlifted 1571-1/2 pounds with this special apparatus. Needless to say, all that heavy partial deadlifting did wonders for his grip strength. At a bodyweight of 170 pounds, Jefferson could also lift a 176 lb. Anvil by the horn. Specific training to build an “iron grip and powerful forearms” was essential to the Oldtime Strongmen for what should be some very obvious reasons: you can’t bend a horseshoe, rip a deck of cards, or tear a phone book in half if you don’t have strong hands. This is also a big factor in why many of the Oldtime Strongmen were well known for their unbelievable grip strength – and why many of their records in that department still stand to this day. Thomas Inch was Britain’s strongest youth at 16, the first official Britain’s Strongest Man and at one time had the largest physical fitness correspondence school in Great Britain. He wrote an untold number of books, courses and training articles and was an excellent strand puller and all-around lifter but in Oldtime strength circles, the name Thomas Inch is recognized above all else for one thing: grip strength. Iron Claws is a rare and extremely hard-to-find training course, full of valuable and result producing information, and is now available once again. In the early 1970’s, Mike Brown set out to bench press maximum weights using a unique partial range of motion training program that he designed. The weights kept growing heavier and one day Brown sprained his wrist with over 600 pounds on the bar. He realized then and there that if his bench press was going to get any stronger, his wrists and forearms would need to follow suit. His research and subsequent experimentation became “Iron Claws: Grip Development and Bench Press Course“. This extremely interesting training course first appeared in 1974 among the many unusual titles in The Madison Co. book catalog. Few copies were printed and even fewer were sold but now you can benefit from this course in the high-quality modern reprint version. 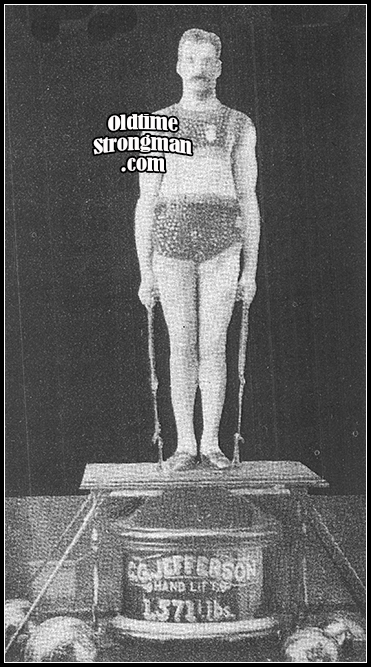 You’ll learn about how the oldtimers developed 16″ forearms and enormous coin bending grip strength, the author’s special wrist roller, rack rebounders for heavy bench pressing, training in mud, and a variety of other unique training ideas. Aston knew full well that stronger hands meant greater strength everywhere else and in 1946 wrote “How to Build a Powerful Grip” teaching how he did so throughout his colorful strongman and stage career. Sit back and read about the pet feats of grip strength of such notable grip masters as: Caswell, Vansittart “The Man with the Iron Grip”, Breitbart, Marx, Topham, Samson, Tolson, Fox, Sandow, Inch, etc. All in all, this publication is not only very informative but entertaining as well. It will provide you with exercises and techniques which can not be found anywhere else. Get a copy and add it to your grip training library, you’ll be glad you did! Fully illustrated, soft cover, and 8-l/2″ x 11″ in size. Molding a Mighty Grip was published as a part of George F. Jowett’s “Molding” library and features one of Jowett’s specialties: grip and forearm training. Formerly a blacksmith and chain maker by trade, Jowett developed powerful hands, 8 1/4″ wrists, 15 1/4″ muscular forearms, and 17-3/4″ upper arms making his incredible feats of grip strength legendary. In addition, Jowett reminisces about many of the famous old-time strongmen and their specialty feats of grip strength. A great book available once again for the truly serious student of grip strength. Get a copy today and start training your grip the way the great George F. Jowett trained his! Fully illustrated, soft cover, and 8-l/2″ x 11″ in size. “…Talking about feats with an anvil reminds me of a particular feat that I performed impromptu which takes a great amount of confidence as well as strength. It happened at one of the times that I picked up an anvil by the horn in a smithy shop, and after that stunt I pressed the anvil to arm’s length by lying it on its broadside upon the flat of my hand, which is not as easy as it sounds. After I had done this I put the anvil on the floor on its base. We began to talk about various anvil feats being so difficult because of its awkward unbalanced construction. One man remarked that it would be some stunt to balance the anvil on the hand upside down. That meant the face would rest on the hand and the heavy wide base on top. Somehow I conceived the notion I could do it, and accordingly I took hold of the face with my right hand, and with the help of the left arm got the weight to the shoulder. A short video clip (with sound) of several of the people, places and training topics that you’ll find in the pages of “Dinosaur Training” by Brooks Kubik.